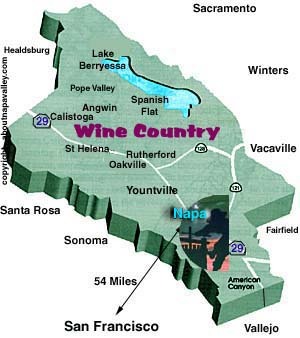 The name Napa was probably derived from the name given to a southern Nappan (meaning "Fairy Valley") Indian Village whose people shared the area with elk, deer, grizzlies and panthers for many centuries. At the time of the first recorded exploration into Napa Valley in 1823, the population consisted of hundreds of Indians. Padre Jose Altimura, founder of the mission at Sonoma, led the expedition. Spanish and Mexican control remained until the Bear Flag Revolution, and the valley became one of the first in California to be settled by American farmers, who started arriving in the 1830s. When California was granted statehood, Napa Valley was in the Territory of California, District of Sonoma. In 1850 when counties were first organized, Napa became one of the original counties of California, and in 1851 the first courthouse was erected. By 1870 most of the Indians who had inhabited the valley were wiped out by smallpox and other diseases brought by white settlers. The few that remained finally were taken into Alexander Valley, where a few descendants now reside on government reservations. The City of Napa was laid out in 1848 by Nathan Coombs on property he had received from Nicolas Higuerra, holder of the original Spanish Grant. The first business establishment was opened in the new city in 1849. It was the gold rush of the late fifties that really built Napa City. After the first severe winter in the gold fields, miners sought refuge in the young city from snow, cold, floods and disease. A tent city was erected along Main Street. There was plenty of work in the valley for disillusioned miners. Many cattle ranches were maintained, and the lumber industry had mushroomed. Sawmills in the valley were in operation cutting up timber that was hauled by team to Napa City, then shipped out on the river to Benicia and San Francisco. In the mid fifties, Napa Main Street rivaled that of many larger cities, with as many as 100 saddle horses tied to the fences on an average afternoon. Hotels were crowded, cash slugs and California coinage were plentiful. Saloons and gambling emporiums were numerous, but culture had also made its debut. There was a lyceum and reading room, an opera house, an agricultural society and other evidences of a maturing community. In 1858 the great silver rush began in Napa Valley, and miners eagerly flocked to the eastern hills. In the sixties, mining was carried on, on a large scale, with quicksilver mines operating in many areas of Napa County. The most noted mine was the Silverado Mine, located on the slope of Mt. St. Helena, which was immortalized by Robert Louis Stevenson in his classic The Silverado Squatters. In the Twentieth Century, the City of Napa became the primary business and economic center for the Napa Valley. As agricultural and wine interests developed north of the City boundary, much of the light industry, banking, commercial and retail activity in the county evolved within the City of Napa and in earlier times along the Napa River through the Historic Downtown. Even today the bulk of the county population lives in Napa. The active economic development program has continued to support the wine and agricultural activities of the Valley to this day. Trip Tip: You can get rates and make reservations for most hotels in the Napa Valley by calling 1-888-254-0637 Outside the US please call 00-800-84469370 OR 1-210-507-5997 By giving code 3536 when calling you receive discount rates plus 110% guarantee. If you find the room cheaper elsewhere you get your money back plus 10% of the difference ion price.